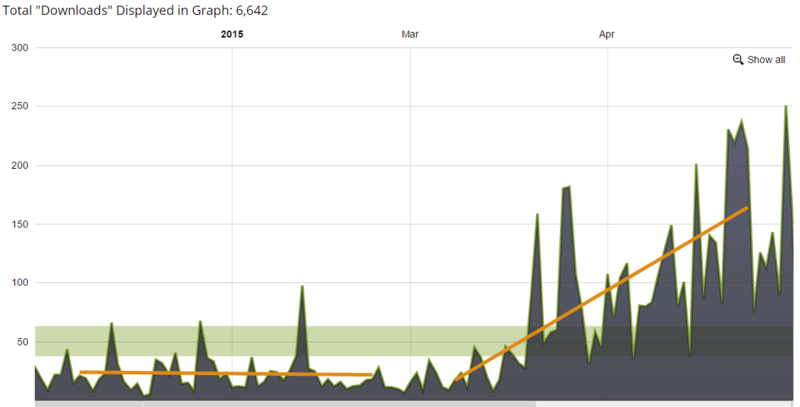 Let’s start out by looking at how the blog did in March. As soon as I reactivated Jetpack, I noticed a slight tick up in search traffic. So I am cautiously optimistic that search traffic will increase in May. Direct traffic was also down, but I think with the way Google Analytics reports that a lot of the traffic it classifies as direct is actually search. An example of why I believe this is the Direct traffic GA reported for this page, creating a brand ambassador program. This is actually a page here, not a post, and it’s not easy to find (I need to change that). But if you google the term ‘creating a brand ambassador program’, it’s one of the top results. And in March it had 33 visitors, and in April that shot up to 121 visitors. So who knows? Referral traffic is down 9% but I’m not too worried about that since referral traffic from the top 4 sources were up and 7 of the top 10. Social traffic was way down, but that’s because I stopped sharing as many links to my posts on Twitter last month. At one point a few weeks ago I was tweeting out links to my articles every 30 minutes all day. I did that mainly as an experiment to see how much social traffic would jump and it did. But it also began to honk off some of my followers to see so many links so I scaled back to one or 2 a day now. Email jumped, but it was mostly from one post on 4-12-2015 about making your blog mobile-friendly and the #Blogchat topic. I wrote 12 posts in April, versus 13 in March. The goal for May is to get up at least 16 posts. 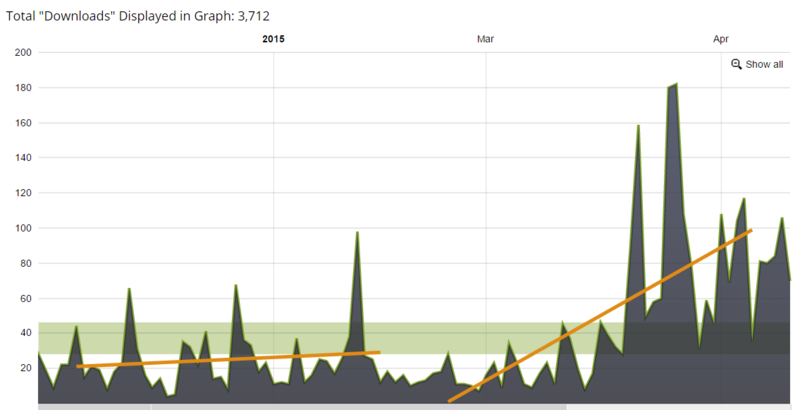 While blog traffic was down sharply last month, podcast downloads spiked sharply in April. As you can see, nice gains in March and even greater gains in April. I’m beyond thrilled with the growth of the podcast. These were the goals I set for both at the start of the year. So it looks like the blog’s goal will be all but impossible to hit, and it looks like the podcast’s goal will be all but impossible to miss. Honestly I will be happy with any growth for both at this point. I’ll be back in one month to share my results for May! I think this was one of the most interesting updates to date. I always used to wonder whether or not removing some plugins to make site speed faster would actually have the opposite effect to what you’re hoping for (might actually lessen traffic instead of increasing it) – I guess this post answers my question! Glad to see you’ve made the fix and traffic is picking up again already. Nice work figuring out it might have had to do with Jetpack! Sometimes it feels like getting your site to load lightening quick is the best way to boost your rankings or to make people stay on the page. Really bad for me, however, as all my sites are quite image-heavy, and as a result will never load the quickest. I do actually think that lowering the image quality of the photos on my sites would be pretty catastrophic; it just wouldn’t look as good at all. This post reassures me that though site speed is a factor in getting people to come to your site and stay on it, it’s definitely not the end all be all. I guess I’ll just cross my fingers and hope everyone’s internet continues to get faster, so I never have to worry about possibly lowering the resolution of all the images on my sites again. Hi Elise, you might want to look at the WP Smush.It plugin for managing images. I use it and it claims to compress images without noticibly affecting image quality. It mostly strips out data that’s not associated with the image itself, it I understand correctly. I use it on my images and can’t personally tell a difference.